In traveling across the country and meeting with thousands of producers we’ve noticed the sentiment has turned quite bleak this winter and spring. From the media to even our own blog posts, there have been constant reminders of how bad the financial and economic conditions are. The overwhelming load of bad news comes after a run of overwhelmingly good, positive stories during the agricultural boom. All this bad news is starting to be a bit depressing so we thought it was time to step back and think about a few of the positive economic trends for production agriculture. Below are seven positive trends as 2016 gets underway. 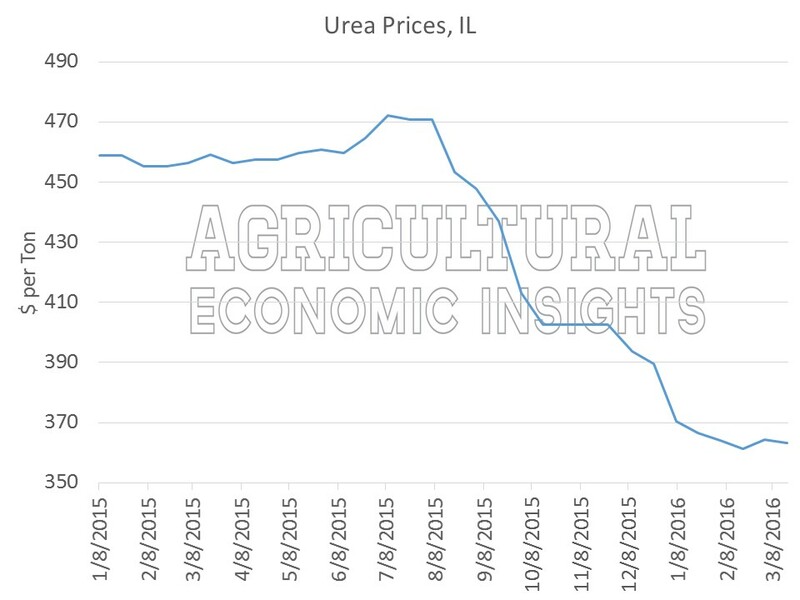 Lower fertilizer prices have been the greatest source of improvement in 2016 crop budgets. 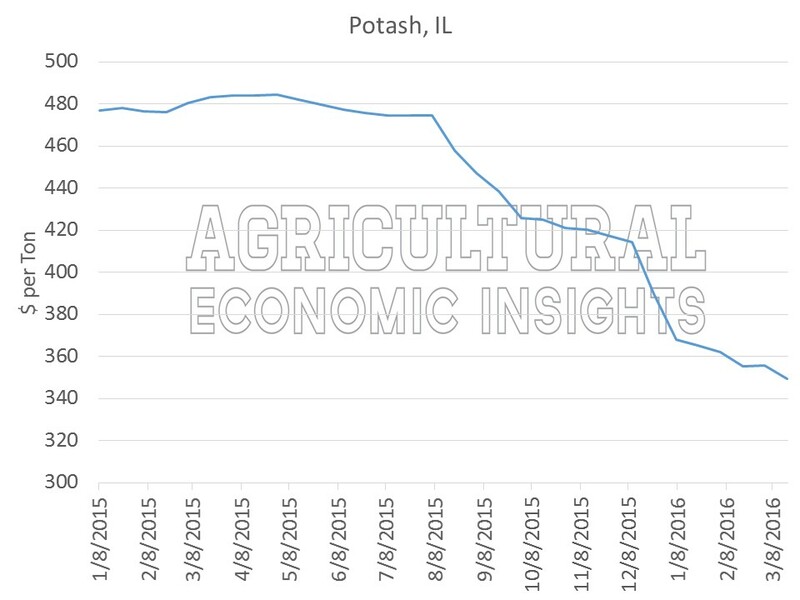 The largest reduction in prices has come from potassium (potash), figure 2. Prices in March are more than 25% lower than spring 2015. Nitrogen prices were also substantially lower; about 20% lower but varied by nitrogen source. 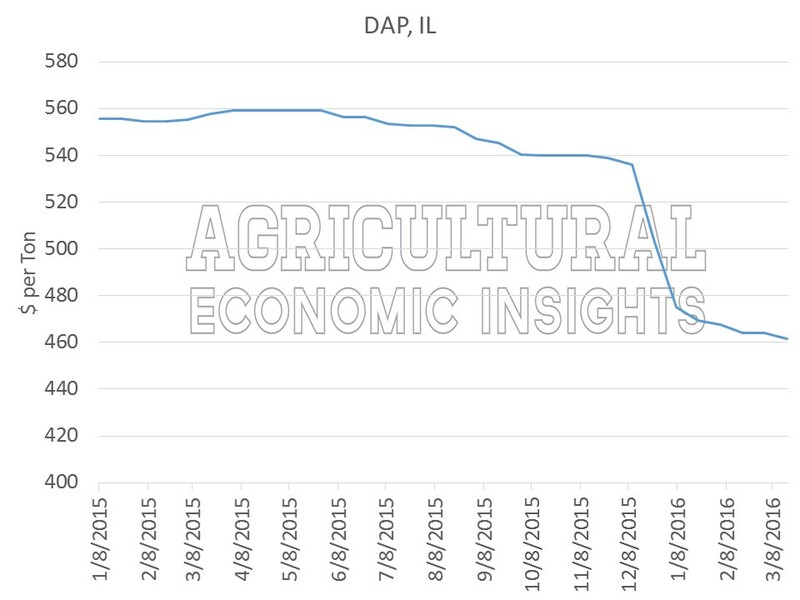 Finally, phosphate prices (DAP) have adjusted lower by more than 15%. Figure 1. 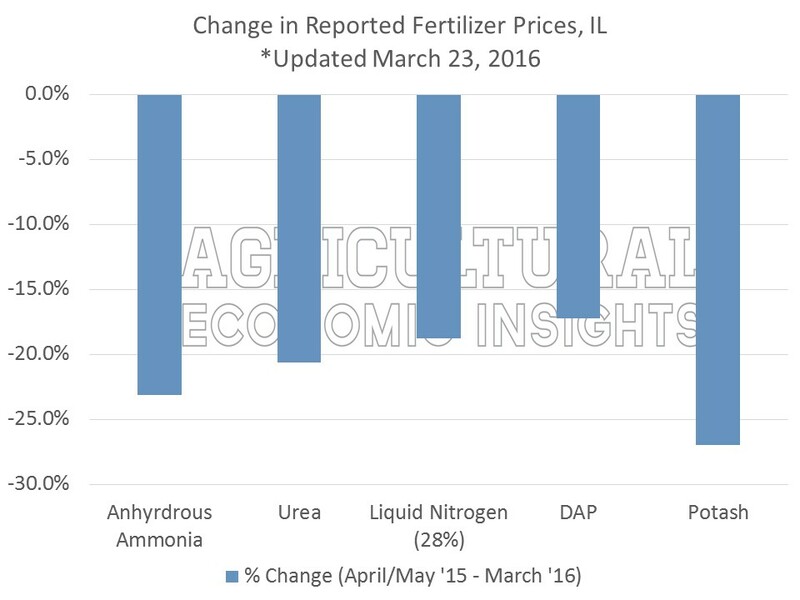 Change in Average Illinois Fertilizer Prices, March 2016 compared to April/May 2015. Data Source: USDA AMS. 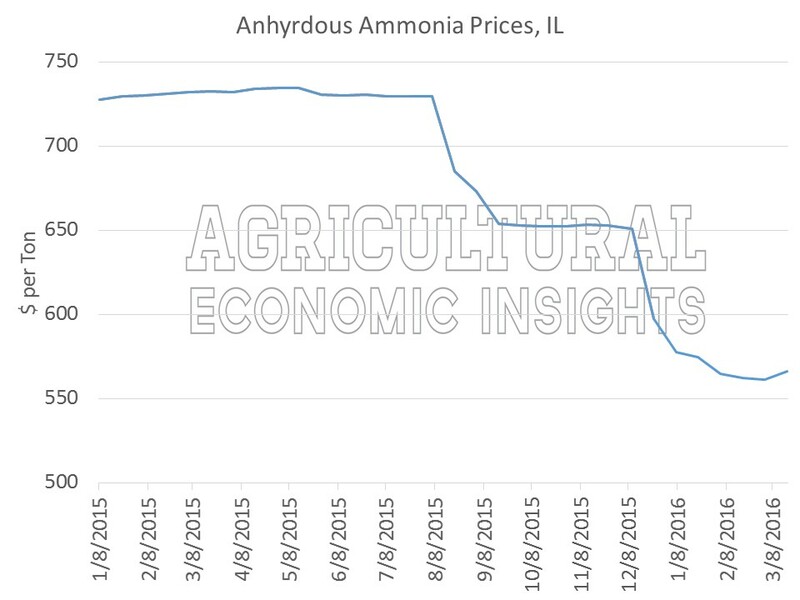 Most recently, nitrogen fertilizer prices have marginally increased off February lows (here and here) while phosphorus and potash have continued lower. The savings on fertilizer have really started to add up. In February, we noted that the savings for corn production was around $32 per acre for a fertilizer mix of 175-70-70. We expect that the savings might be even greater for many producers. In a recent post we took a look at farm fuel prices. Prices were at the lowest levels since 2010 and have fallen substantially from recent years. Since 2014 farm fuel prices fell 50%; down 30% from January 2015 prices. Ultimately the magnitude of these savings will depend on how much diesel fuel a farm uses. While many of us tend to discount fuel savings now that reduced and no-till practices are widely adopted, fuel is still an important input and the savings will be meaningful for many producers, especially those that rely on diesel for irrigation, or those that dry a significant amount of their crop production. High land rents have been one of the most important contributors to reduced profitability for most farmers. There are now signs that rents are finally starting to adjust downward (Iowa, Indiana, Nebraska). While the percentage declines have been relatively modest to date, the dollar amounts will help producers who are able to renegotiate rents. Reductions in land values and rents are a mixed blessing. Land values and rents tend to follow the economic conditions in the sector, increasing in good times and falling when times are tight, but the adjustment is never instantaneous. So while falling land rents mean that times are tough and have been for a while, at least they are falling to help stabilize operating profits. Equipment has been other major contributor to high fixed costs. As we recently pointed out, signs indicate that farmers have significantly curtailed investment in equipment. This reduction should help improve the profitability situation going forward. In total, the declines in fixed costs will begin to contribute to a stabilization of profitability, and combined with reductions in variable costs can amount to significant savings. Last fall we took a look at interest rates (here and here) and found that the average interest rate on farm loans is at historically low levels. This is important (and good news) as the agricultural sector has been adding debt during the leaner times. Furthermore, even as interest expenses as a share of earnings has increased in recent years (due to higher debt levels), it has remained within the range of recent conditions (interest expense less than 30% of earnings before interest) and well below levels experienced during the late 1970s and early 1980s (around and above 50% of earnings before interest). A few weeks ago we noted that one major difference between the current economic slowdown in agriculture and the farm financial crisis in the 1970s and 1980s was inflation. During the 1980’s infamous farm economy crisis, inflation was rampant with several year posting double-digit annual increases. This created several challenges and unusual incentives, such as very low real interest rates and strong farmland gains making it attractive to heavily finance farmland purchases. Today, inflation is low. Since 2011, inflation has been below 2%. While many rightfully worry that inflation may be looming, it just isn’t currently there. In February the USDA offered its first look at and estimate of the overall farm economy in 2016. Their estimates were that net farm income would be 3% lower than 2015. This is much improved from the 27% decline experienced in 2014 and 38% decline in 2015. While it’s hard to get excited about a slowing rate of decline, it does appear that some experts feel that the adjustment won’t be as large in 2016. These data and estimates are just that, estimates. A lot can and will change between now and January 2017. Large crops could place further downward pressure on commodity prices, while a short crop could boost prices and incomes. However, producers should take some comfort in that the USDA does not currently foresee another plunge in net farm incomes. While much of the economic news in the farm sector is indeed negative, there are some positive signs. In our opinion the most important positive trend is that the cost of production is heading lower for many producers. This has been driven mainly by lower fertilizer prices, but fuel and overhead costs (including cash rent) are also lower for 2016. In some cases it is likely that the cost of production for corn has likely fallen by $50 to $60 per acre. In short, the price recovery necessary to restore profitability is not as large as would have been required in the previous two years. We may not get there, but the improved cost structure is a good sign for the future. While the agricultural sector was probably one of the furthest things from Mr. Mark’s thoughts, we couldn’t help notice the parallels. Yes conditions in agriculture are tough, but there are a few good nuggets buried in the bad news.